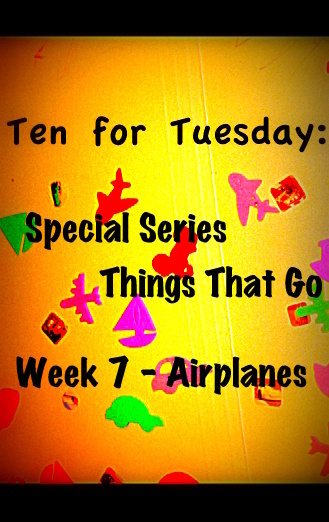 I am really enjoying our Ten for Tuesday: Things That Go Series! This week we focus on outer space with rocket ships, space shuttles and much more! Enjoy! (Posting a tad on the late side this week because of a holiday weekend off the computer to focus on quality family time, but if the post ends up going live for many of you on Wednesday, well that is okay too because on February 20th in 1962 John Glenn piloted NASA's first successful orbit of an astronaut around the Earth -- he became the first American to orbit the Earth ultimately orbiting around the Earth three times). 1. Read - Two other great books that also offer learning opportunities and imaginative inspiration are: On the Launch Pad: A Counting Book by Michael Dahl and Not A Box by Antoinette Portis. 2. 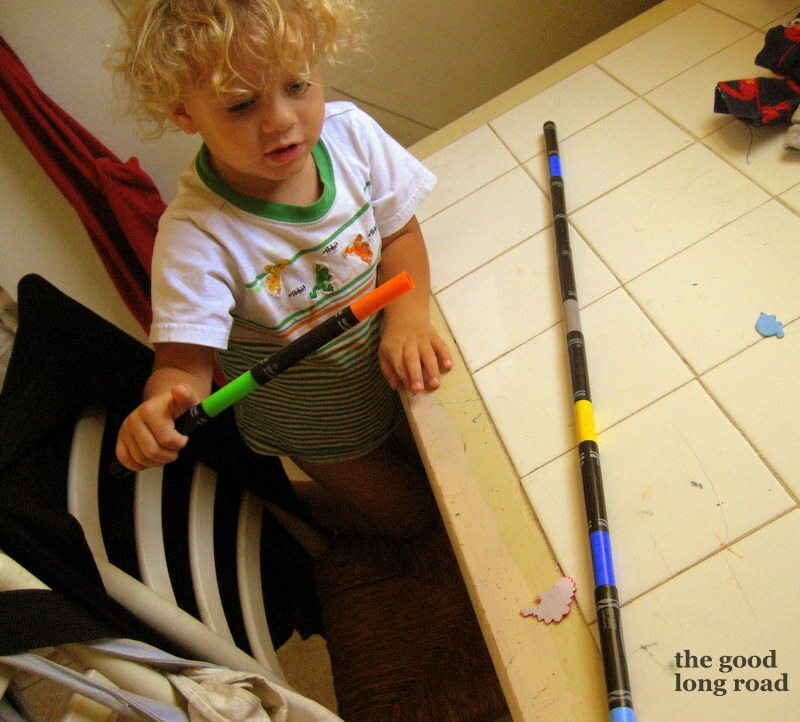 Learn - Solar System activities for budding rocketship/space/astronaut enthusiasts. 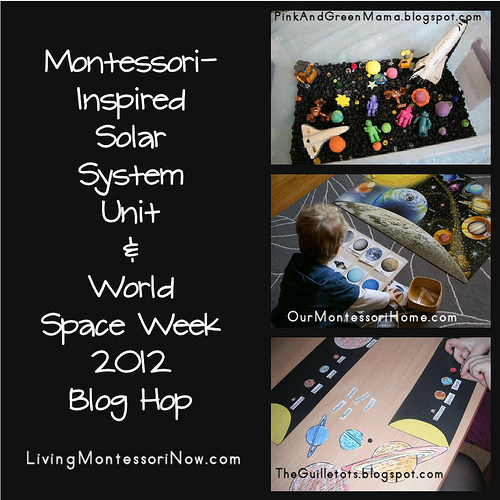 Living Montessori Now has a great Montessor-Inspired Solar System Unit, which also includes one of my favorite Blog Hops from last year: Space Week Blog Hop. 3. 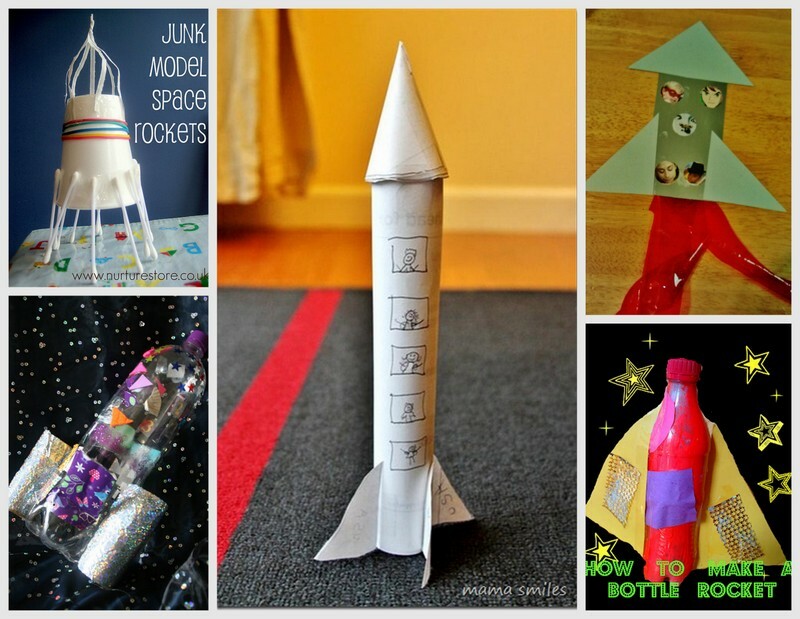 Art & Crafts - Make Some Rockets! 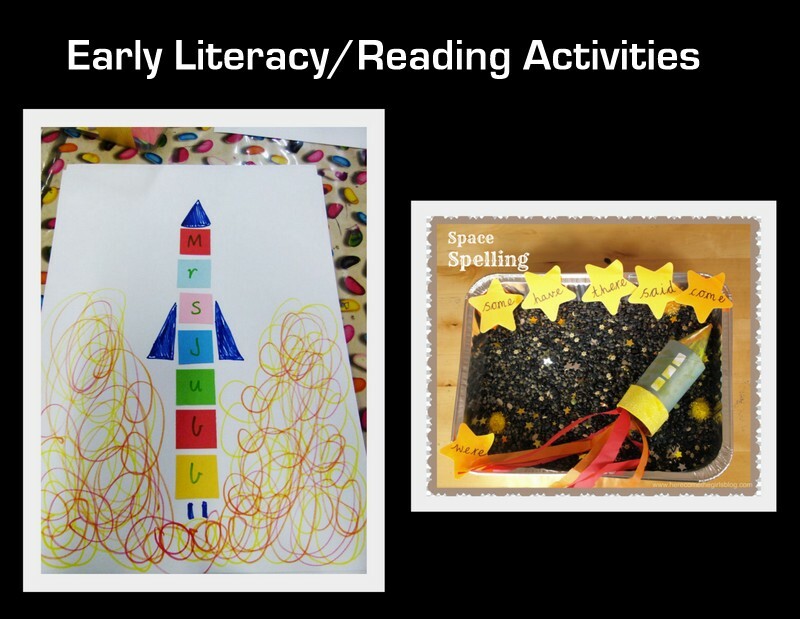 Rockets provide lots of fun art and craft opportunities as evidenced by all of these creative rocket ships from: Mummy Mummy Mum, Nurture Store (love her junk model space rocket), and Create With Your Hands and Playful Learners both have great recycled bottle rockets that I love too. Plus, Mama Smiles has a great paper space shuttle as does Art Mama Says, who cleverly incorporates family photos. 4. 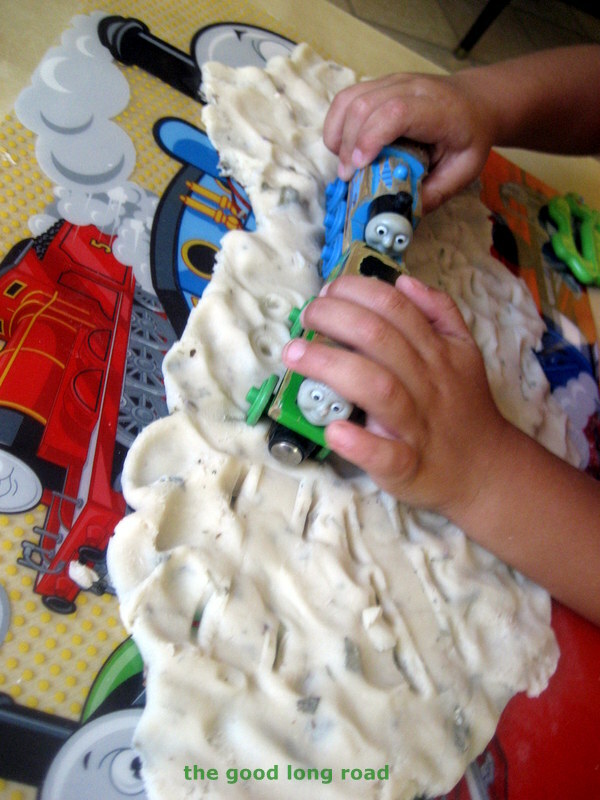 Have Some Sensory Fun! 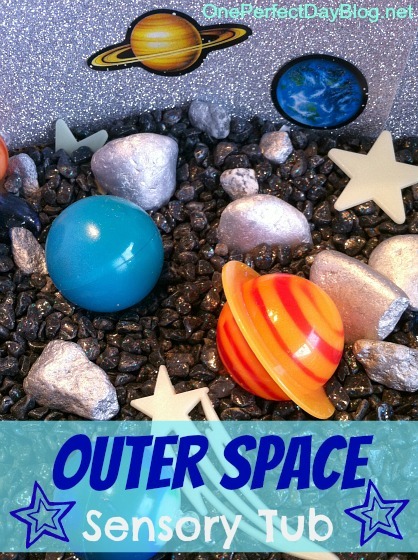 - We love sensory bins, and this one from One Perfect Day is a wonderful idea for any space-themed fun you might have going on. 5. Blast Off - Imaginative Play! 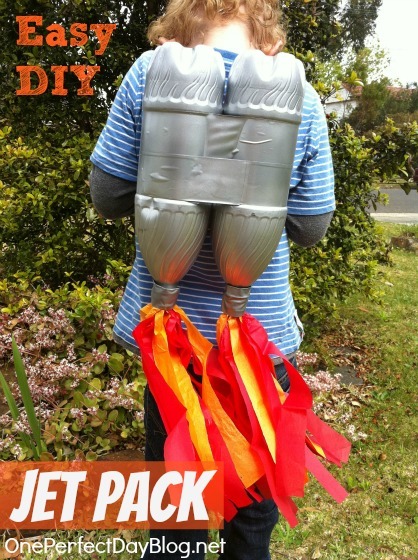 Also from One Perfect Day, this jet pack costume is superbly awesome and I just had to share it! Another great space imaginative play idea comes from Mama Smiles with this simple parachute making activity - also a great way to teach children that astronauts use parachutes when coming back to Earth from space with capsule parachute landings. 6. Space Spelling + Sight Word Activities Here Comes the Girls featured this Space Spelling Activity that also has a sensory component and Lessons From A Teacher uses rocket ships for name spelling fun. 7. Explore the Moon - Of course, when making rocket ships and space shuttles, the Moon is often a favorite destination, so I had to share this great post from What Do We Do All Day that features 5 great moon activities. 8. Rocket and Space-Inspired Snacks - In my Ten for Tuesday Things That Go Series, I always include a snack time component, and this week Iove all of the amazing snacks that Artsy Craftsy Mom shared in her post that is full of party ideas for a fabulous outer space-themed party. 9. 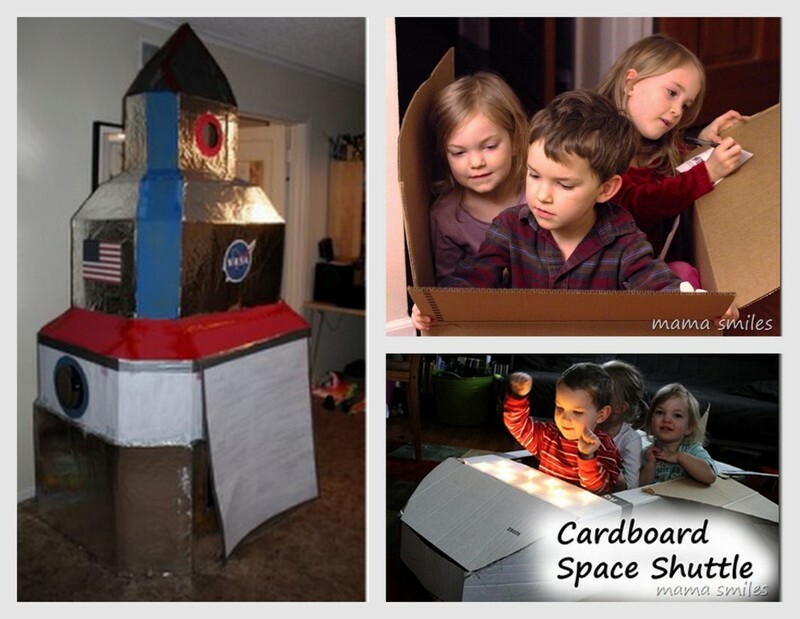 Cardboard Space Stations/Rocket Ships and Space Shuttles - I also love to include cardboard creations in the series too, and this week Mama Smiles had me covered with two great space ship/space shuttle cardboard creations: Space Fun with Packing Peanuts and a Lighted Space Shuttle. Plus, I love this giant cardboard rocket ship from Filth Wizardry. 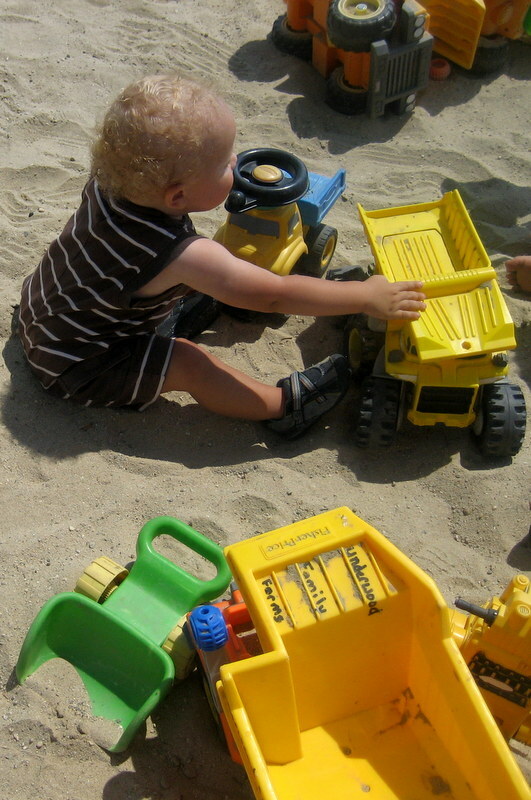 Sharing at: Mom's Library, The Sunday Showcase, Tuesday Tots, Its Playtime! Kid Lit Blog Hop, Read.Explore.Learn, Kids Craft, Eco Kids Tuesday, and at The Children's Bookshelf. Cool ideas! Beyond trains, my son has a secondary interest in space and rockets, especially now that he's obsessed with Angry Birds Space and Angry Birds Star Wars, so he'd enjoy a lot of these activities. Thanks! What a wonderful set of activities! I love all the spaceships! I love Wild Thing's marker rocket ships! I think Nurture Store's junk model rocket ship is amazing too. Thanks for featuring us, and for sharing all these fun ideas! What a fun collection of books and idea. I also love the book Cookiebot: A Harry and Horsie Adventure. Thanks for sharing at The Children's Bookshelf. P.S. I forgot to say, thanks for including my moon activities! 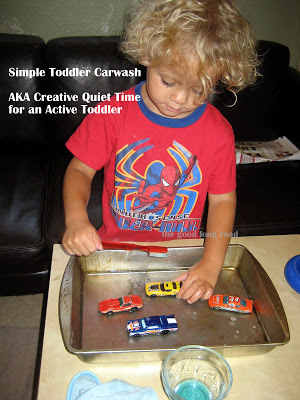 What great activities, thanks so much for posting all of these ideas! 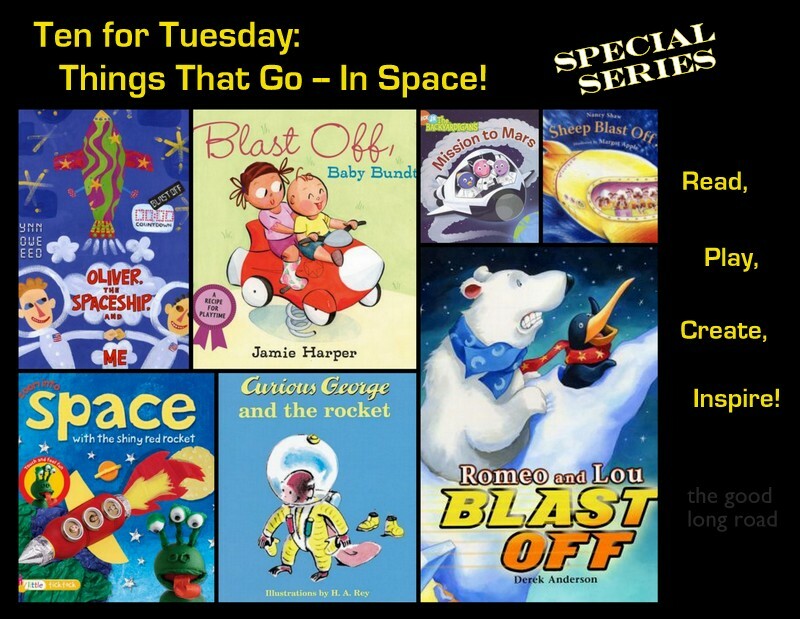 (And, Curious George and the Rocket was one of my faves as a kid) Got here via the Kid Lit Blog Hop! I made a similar cardboard roll rocket and filled it with fun stuff and used it as an alternative for bon bons for the kids for Christmas. Great post. I am going to share this wonderful post on Pinterest and Facebook. Space is such a wonderful and exciting project, my son is really into it at the moment! Love your books and activities. I love that jet pack! We love the Backyardigans in our house - well, at least when my kids were younger they did. Thanks for linking in the Kid Lit Blog Hop. So many great ideas! I love all of the rockets made from recycled bottles and the cardboard space shuttle too. 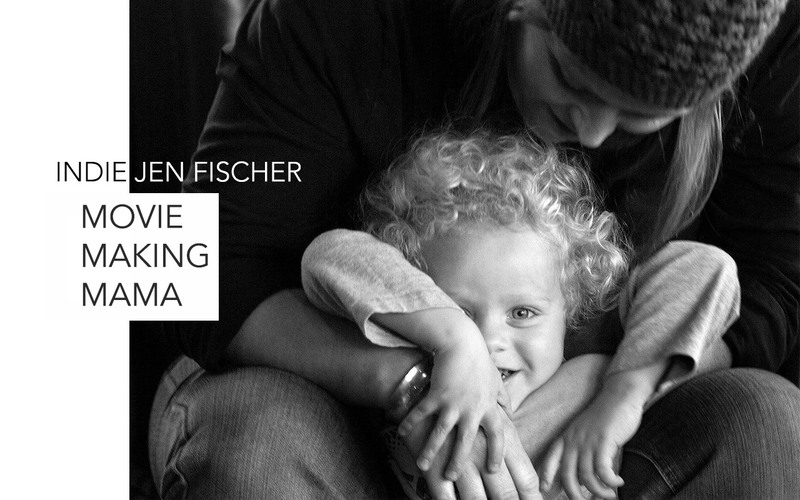 Thanks for including us in this round up! I've pinned this to my "Exploring Our World" board. Love love love this post! These activities look like so much fun. I can't wait to do another space unit with my kids. Thanks so much for sharing at Discover and Explore. I'm featuring this post today. Kid's Co-Op: 5 Simple Ways to Make Math Fun!